These 12 terrifying movies like IT will definitely make you want to hide under your bed for a long time! Check them out…if you dare! IT is an upcoming supernatural horror movie, due in theaters on September 8, 2017. It is based on the 1986 book, of the same name, by Stephen King. Check out the trailer, then read on for some other great movies that are similar to IT. Killjoy is a 2000 slasher movie. It is the 1st in a series of 4 movies: 2002- Killjoy 2: Deliverance from Evil, 2010- Killjoy 3, 2012- Killjoy Goes to Hell and 2016- Killjoy’s Psycho Circus. The Ring is a 2002 supernatural psychological horror movie. It is a remake of the 1998 Japanese movie- Ringu- and based on the 1991 book, of the same name, by Koji Suzuki. It is the prequel to the 2005- The Ring and the 2017- Rings. The movie stars Naomi Watts, Amber Tamblyn, Adam Brody and Sara Rue. Darkness Falls is a 2003 supernatural horror movie. It is based on the 2003 book- Darkness Falls: The Tragic Life of Matilda Dixon- by Joe Harris. The movie stars Chaney Kley and Emma Caulfield. Fear of Clowns is a 2004 horror movie that is the prequel to the 2007 movie- Fear of Clowns 2. The Grudge is a 2004 supernatural horror movie. It is a remake of the 2002 Japanese movie- Ju-on: The Grudge and is the prequel to the 2006- The Grudge 2 and the 2009- The Grudge 3. The movie stars Sarah Michelle Gellar, Jason Behr and Bill Pullman. The Amityville Horror is a 2005 supernatural horror movie. It is a remake of the 1979 movie, of the same name and is based on the 1977 book, of the same name, by Jay Anson. The movie is the 9th movie in the film series and stars Melissa George, Ryan Reynolds, Jesse James and Chloe Grace Moretz. The Messengers is a 2007 supernatural horror movie. It is the prequel to the 2009- The Messengers 2: The Scarecrow and stars Kristen Stewart, John Corbett, Penelope Ann Miller and Dylan McDermott. All Hallows’ Eve is a 2013 horror movie. It features the character- Art the Clown and is based on the 2008 movie- The 9th Circle and the 2016 movie- Terrifier. Carrie is a 2013 supernatural horror movie. It is based on the 1974 book, of the same name, by Stephen King. It is the 3rd adaptation of the book: 1976- Carrie and 1999- The Rage: Carrie 2. The movie stars Chloe Grace Moretz, Julianne Moore, Judy Greer and Ansel Elgort. The Conjuring is a 2013 supernatural horror movie. It is the prequel to the 2016 movie- The Conjuring 2 and stars Vera Farmiga and Patrick Wilson. Clown is a 2014 supernatural horror movie that stars Laura Allen, Andy Powers, Eli Roth and Peter Stomare. 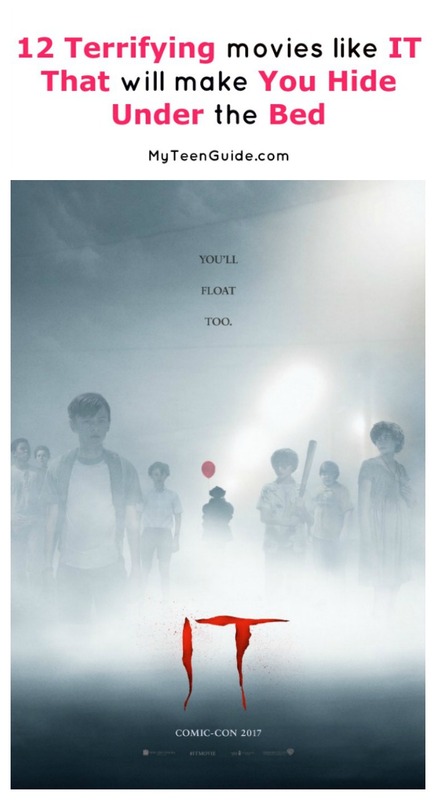 While not all of these movies are about clowns, they all have one thing in common with IT: they’ll make you want to sleep with your lights on for at least a month! If you still want more scares, check out our definitive list of 100 must-see horror movies! Do you have any favorite scary movies like IT? Share below!